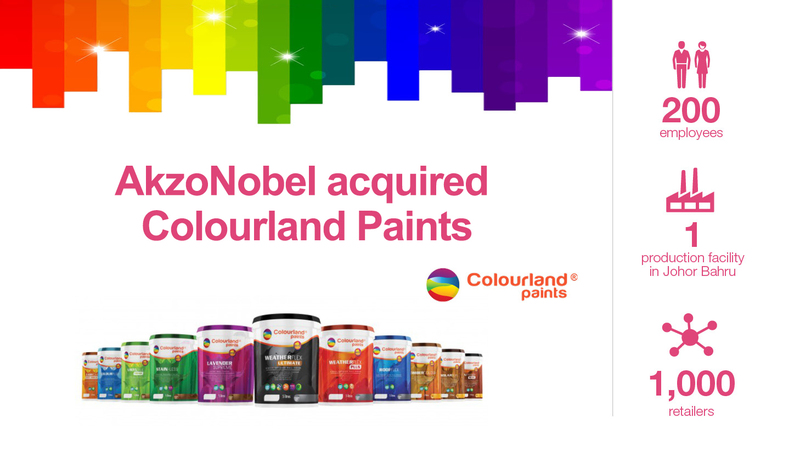 AkzoNobel has strengthened its business in Asia by acquiring (100% shares in) Colourland Paints Sdn Bhd and Colourland Paints (Marketing) Sdn Bhd – both referred to as “Colourland Paints” – a home-grown paints and coatings manufacturer with wide distribution across Malaysia. The acquisition enhances AkzoNobel’s global portfolio with a much-loved local brand. It also means the company will be able to provide an improved customer experience through an expanded product offering and distribution network. Financial details were not disclosed. The transaction includes all relevant technologies, patents, trademarks and assets of Colourland.